Friday, November 9th at 10:30am East Elementary School 3905 Alder Lane, Tillamook — An assembly planned by students to honor Veterans. The Coast Guard Honor Guard will present the colors and a cake social for Veterans will follow the event. 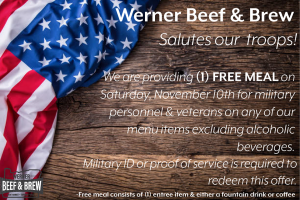 Saturday, November 10th – Werner’s Beef & Brew, 2807 3rd St., Tillamook Veterans & active duty military please join us this Saturday Nov. 10th to enjoy a FREE meal on us! We thank you for your service!